Diet and nutrition play an important role in not only your general health but also your eye’s health. Adding certain nutrients to your diet by food or supplementation can help promote clear and healthy vision. Lutein, zeaxanthin, omega 3s, vitamin C and E are just a few key nutrients that should be added to everyone’s daily diet. Lutein and zeaxanthin filter out high-energy blue light that comes from electronic devices such as phones and tablets. These harmful light rays can damage the eyes over time by reducing the amount of protective macular pigment found in the center of vision. This in turn can lead to a devastating ocular disease called macular degeneration. These nutrients also act as antioxidants to filter out any free radical damage occurring over time which can lead to cataracts. Therefore, studies have shown that those with high intake of lutein and zeaxanthin can have a lower risk of developing cataracts or macular degeneration. It is vital to note that the body does not naturally produce these key nutrients, therefore to obtain your daily amounts you must have a diet that is high in green leafy vegetables (kale, spinach, broccoli) and other foods such as eggs. Omega 3 fatty acids are considered another important nutrient for the eyes that is found in cold-water fish (salmon, mackerel), seeds (flaxseed, chia seed) and some nuts. These essential fatty acids are shown to be anti-inflammatory and rich in docosahexaenoic acid (DHA)—a component found in low levels in those with dry eye. Studies have also shown that omega 3s can reduce the risk of age-related macular degeneration. According to the FDA you should consume about 3-4g/day of omega 3s. Vitamin C and Vitamin E are antioxidants mainly found in fruits (lemons, grapefruit, oranges) and nuts and sweet potato, respectively. These antioxidants help protect the eye’s cells from unstable molecules which break down healthy tissue. 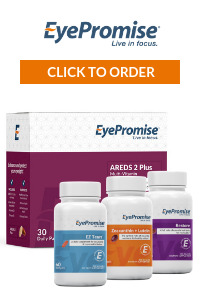 Scientific evidence has shown that in addition to being taken with other supplements, these vitamins can slow the progression and formation of cataracts as well as macular degeneration. The FDA recommends 90mg/day supplementation in men and 75mg/day in women for vitamin C and 22 IU of vitamin E per day. It is important to remember that eating healthy is not only good for the eyes, but also for your overall health. With the prevalence of diabetes and hypertension being so high it is critical to understand that these conditions can affect the eyes. Although genetics does play a role in both, lifestyle choices such as exercise and diet are major modifiable risk factors. The Eye Center doctors recommend several dietary supplements that allow patients to obtain the daily intake of nutrients that benefit their individual needs. The link to the right will take you to some of those products if they were prescribed for you! Here’s to a lifetime of healthy vision!